Brad makes his only appearance in "Daria Dance Party". 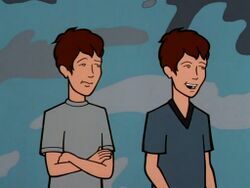 He and his brother Brett goes to Cumberland High but attend the Lawndale High dance portrayed in the episode, where they try to woo Daria and Jane - Brad being the one to open negotiations. They have some success until they reveal themselves as Upchuck's cousins. Brad was more bothered than Brett when Daria and Jane fled from them. They seem close to their cousin "Chuck", turning up to see his DJ act & hang out with him afterwards. They also knew who Daria meant when she called him "Upchuck" and showed no reaction to it. Brad had been reading a book on serial killer Jeffrey Dahmer.